This scenario describes a high-availability implementation of the OpenStack Networking service using the ML2 plug-in and Linux bridge. This high-availability implementation augments the Scenario: Classic with Linux Bridge architecture with Virtual Router Redundancy Protocol (VRRP) using keepalived to provide quick failover of layer-3 services. See Packet flow for VRRP operation. Similar to the classic scenario, all network traffic on a project network that requires routing actively traverses only one network node regardless of the quantity of network nodes providing HA for the router. Therefore, this high-availability implementation primarily addresses failure situations instead of bandwidth constraints that limit performance. However, it supports random distribution of routers on different network nodes to reduce the chances of bandwidth constraints and to improve scaling. Also, this implementation does not address situations where one or more layer-3 agents fail and the underlying virtual networks continue to operate normally. 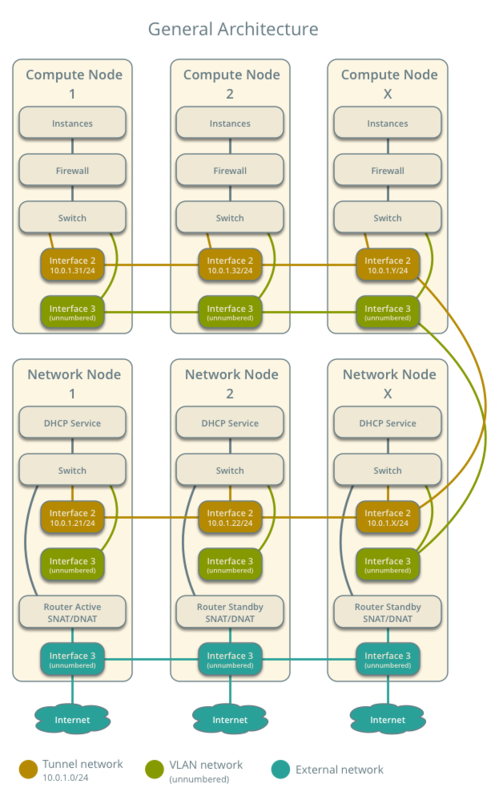 Consider deploying Scenario: High Availability using Distributed Virtual Routing (DVR) to increase performance in addition to redundancy. As of the Liberty release, you cannot combine the DVR and L3HA mechanisms. The failover process only retains the state of network connections for instances with a floating IP address. 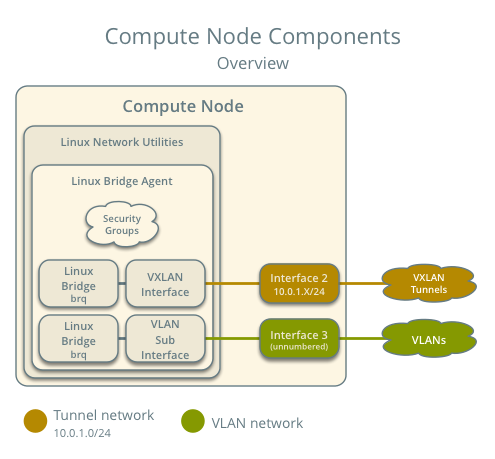 The example configuration creates one flat external network and one VXLAN project (tenant) network. However, this configuration also supports VLAN external and project networks. Due to a bug, we recommend disabling the layer-2 population mechanism for deployments using VXLAN project networks. For more information, see https://bugs.launchpad.net/neutron/+bug/1523031. 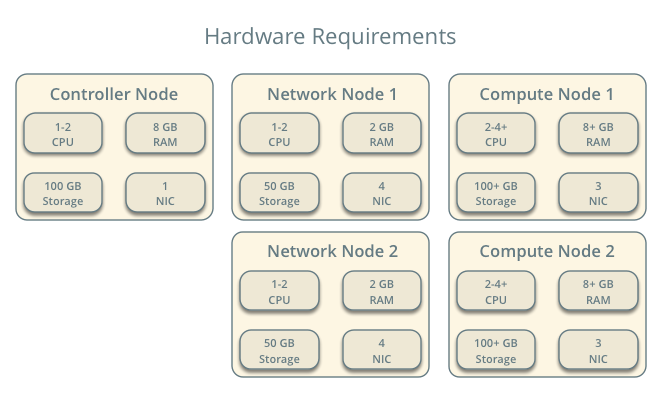 These prerequisites define the minimal physical infrastructure and immediate OpenStack service dependencies necessary to deploy this scenario. For example, the Networking service immediately depends on the Identity service and the Compute service immediately depends on the Networking service. 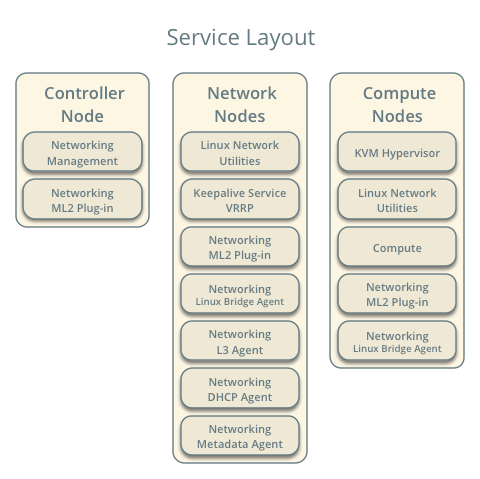 These dependencies lack services such as the Image service because the Networking service does not immediately depend on it. However, the Compute service depends on the Image service to launch an instance. The example configuration in this scenario assumes basic configuration knowledge of Networking service components. For assistance with basic configuration of the Networking service, see the Installation Guide. 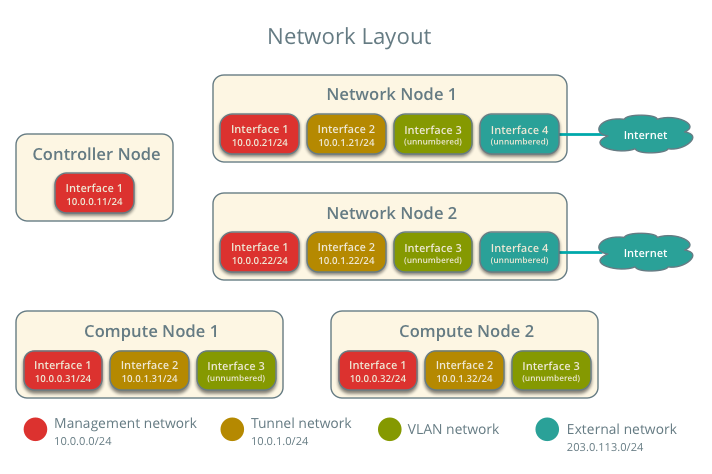 At least two network nodes with four network interfaces: management, project tunnel networks, project VLAN networks, and external (typically the Internet). 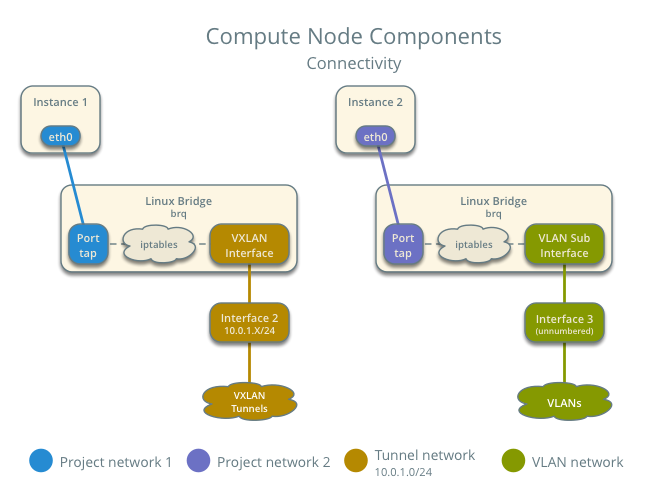 At least two compute nodes with three network interfaces: management, project tunnel networks, and project VLAN networks. 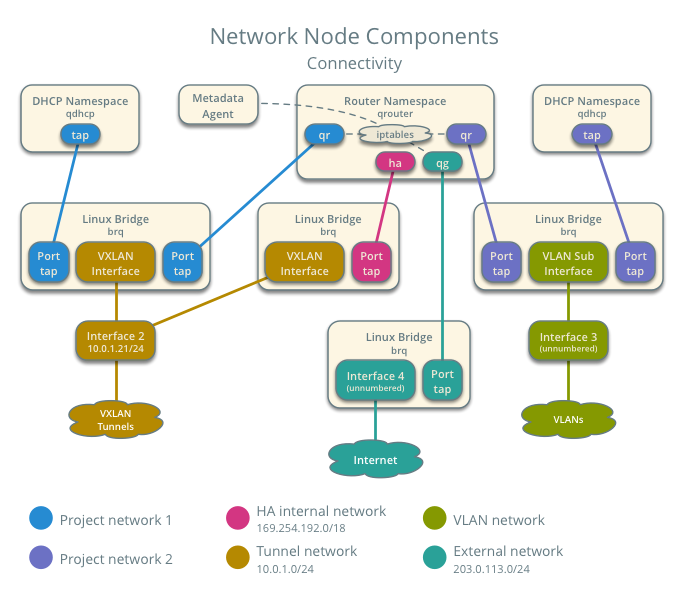 To improve understanding of network traffic flow, the network and compute nodes contain a separate network interface for project VLAN networks. In production environments, you can use any network interface for VLAN project networks. In the example configuration, the management network uses 10.0.0.0/24, the tunnel network uses 10.0.1.0/24, the VRRP network uses 169.254.192.0/18, and the external network uses 203.0.113.0/24. The VLAN network does not require an IP address range because it only handles layer-2 connectivity. For VLAN external and project networks, the network infrastructure must support VLAN tagging. For best performance with VXLAN project networks, the network infrastructure should support jumbo frames. Operational OpenStack Compute hypervisor service with appropriate configuration to use neutron in the nova.conf file. L3 agent managing the qrouter namespaces and VRRP using keepalived. The qrouter namespaces provide routing between project and external networks and among project networks. They also route metadata traffic between instances and the metadata agent. For simplicity, the hidden project network that connects all HA routers for a particular project uses the VXLAN network type. 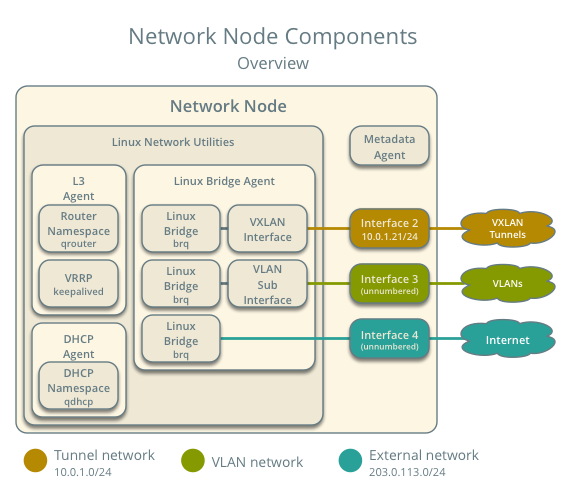 Linux bridge agent managing virtual switches, connectivity among them, and interaction via virtual ports with other network components such as namespaces, security groups, and underlying interfaces. The L3HA mechanism simply augments Scenario: Classic with Linux Bridge with quick failover of layer-3 services to another router if the master router fails. During normal operation, the master router periodically transmits heartbeat packets over a hidden project network that connects all HA routers for a particular project. By default, this network uses the type indicated by the first value in the tenant_network_types option in the /etc/neutron/plugins/ml2_conf.ini file. If the backup router stops receiving these packets, it assumes failure of the master router and promotes itself to the master router by configuring IP addresses on the interfaces in the qrouter namespace. In environments with more than one backup router, the router with the next highest priority becomes the master router. The L3HA mechanism uses the same priority for all routers. Therefore, VRRP promotes the backup router with the highest IP address to the master router. The default policy.json file allows only administrative projects to enable/disable HA during router creation and view the ha flag for a router. Added interface 4cb8f7ea-28f2-4fe1-91f7-1c2823994fc4 to router demo-router. Older versions of python-neutronclient do not support the ha_state field. On the network nodes, verify creation of the qrouter and qdhcp namespaces. Both qrouter namespaces should use the same UUID. The qdhcp namespaces might not appear until launching an instance. On each network node, the qrouter namespace should include the ha, qr, and qg interfaces. On the master node, the qr interface contains the project network gateway IP address and the qg interface contains the project network router IP address on the external network. On the backup node, the qr and qg interfaces should not contain an IP address. On both nodes, the ha interface should contain a unique IP address in the 169.254.192.0/18 range. On the network nodes, verify VRRP advertisements from the master node HA interface IP address on the appropriate network interface. The example output uses network interface eth1. Source the credentials for a non-privileged project. The following steps use the demo project.